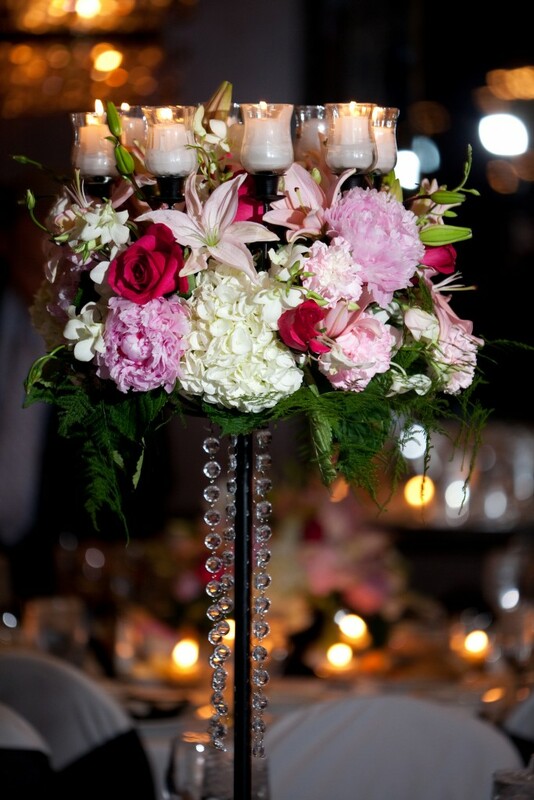 Is your wedding Pintrest board filled with ideas for centerpieces and event design? 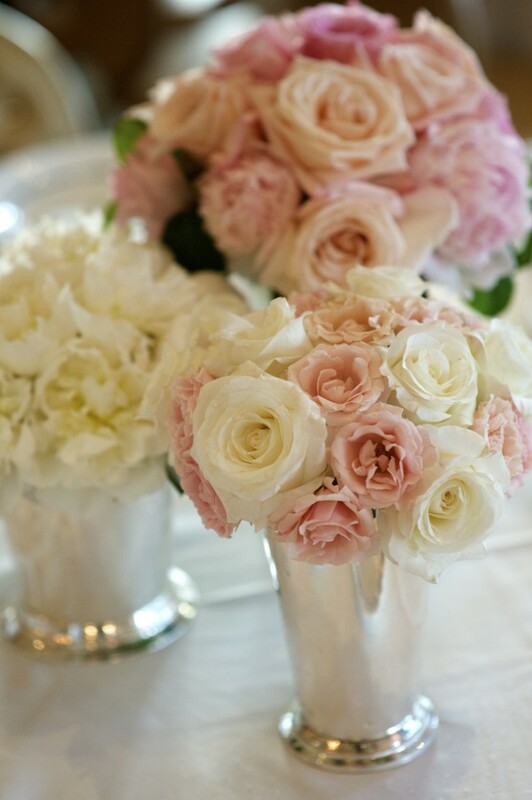 Centerpieces don’t have to be floral. Think seasonal and outside the box (or vase) to help keep costs down. Also consider your guests. The last thing you want is for a guest to pick up that giant expensive centerpiece and put it on the floor because they can’t see each other across the table. Check out our Pintrest board “Centers of Attention” for more ideas. 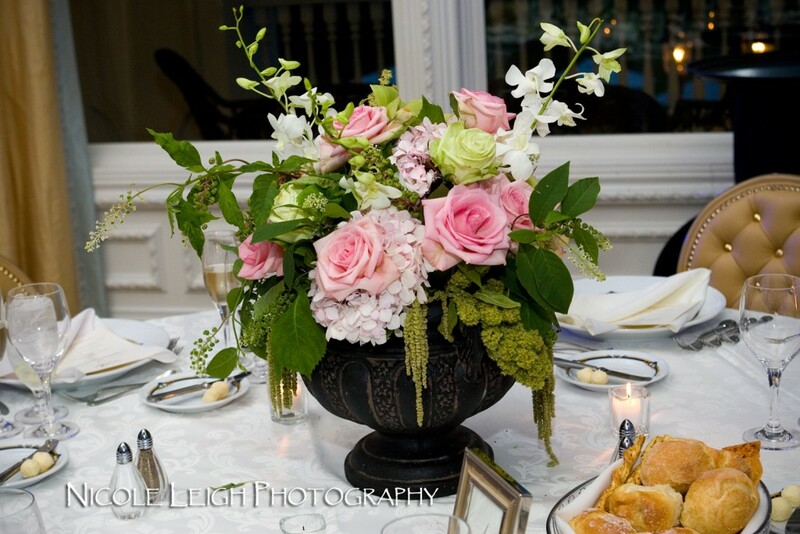 Here are a few of the centerpieces that came out of the collaboration of our clients and their floral designers. Check back periodically as we add new photos from recent events. 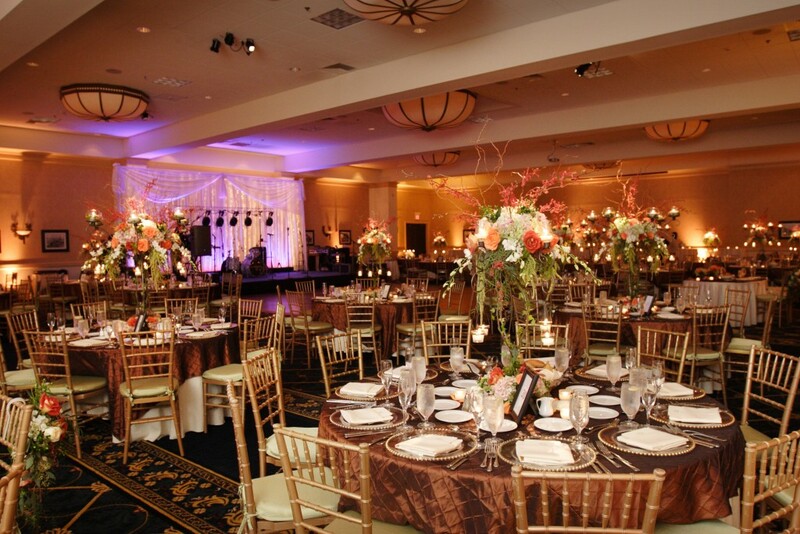 Elizabeth & Roger’s wedding dinner was spread out over three rooms at their restaurant venue. 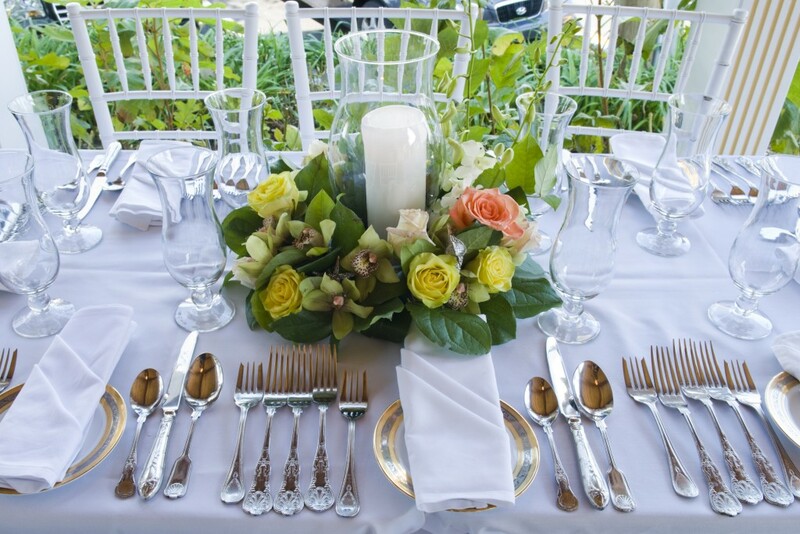 Roger’s daughter provided the flowers to a local florist who created lush arrangements for each table that reflected the location (indoors or out) and the decor in each room. 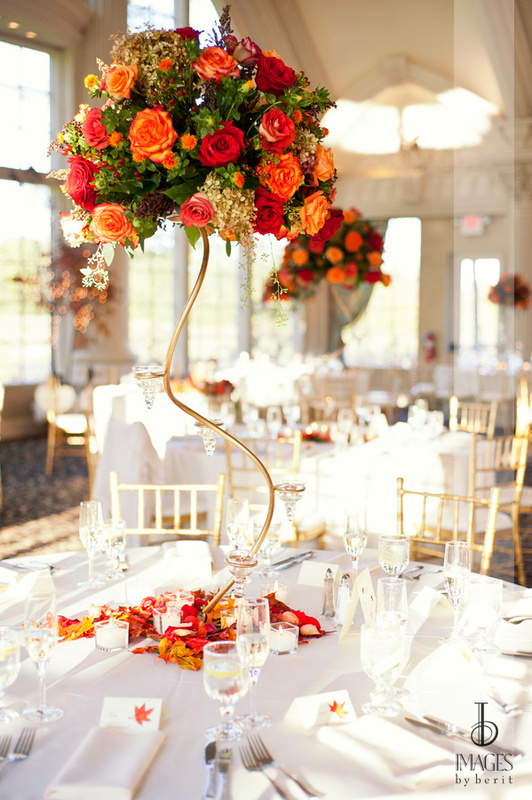 Morgan and Craig’s fall themed wedding featured an arrangement of jewel colored roses, hydrangea, and berries on thin curved bases making it very easy for guests to see each other across the table. Photo courtesy of Images by Berit. 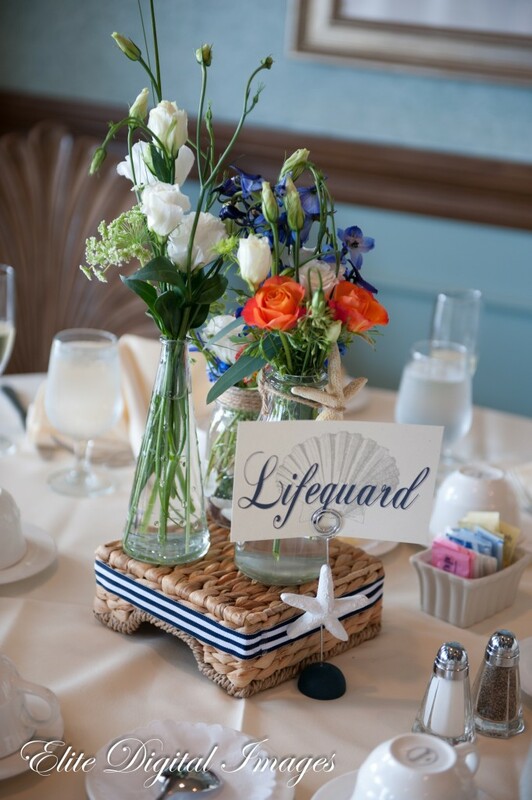 Kim and Jon kept it very simple for their beach themed wedding. 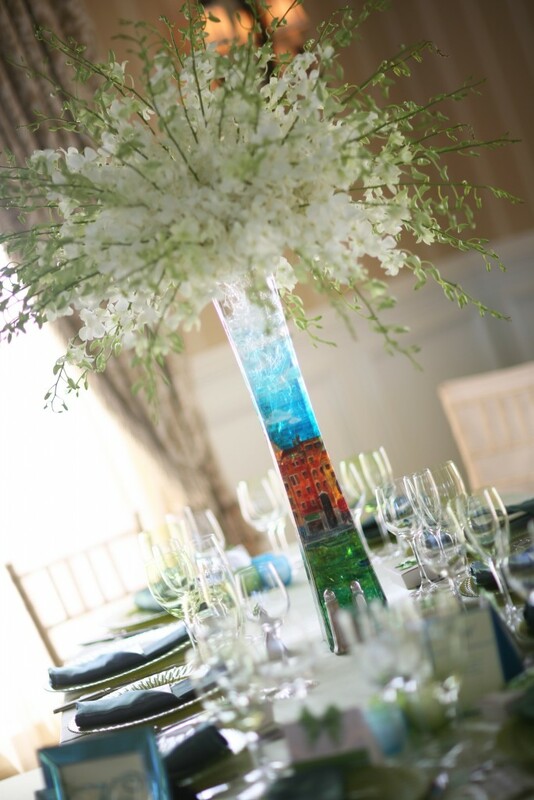 Small vessels in various sizes were filled with colorful flowers and arranged on top of an upside down woven napkin holder. Accents included striped ribbon, jute string, and seashells. You could definitely DIY this. Photo courtesy of Elite Digital Images. No two centerpiece displays at Brian and Mike’s wedding were the same. 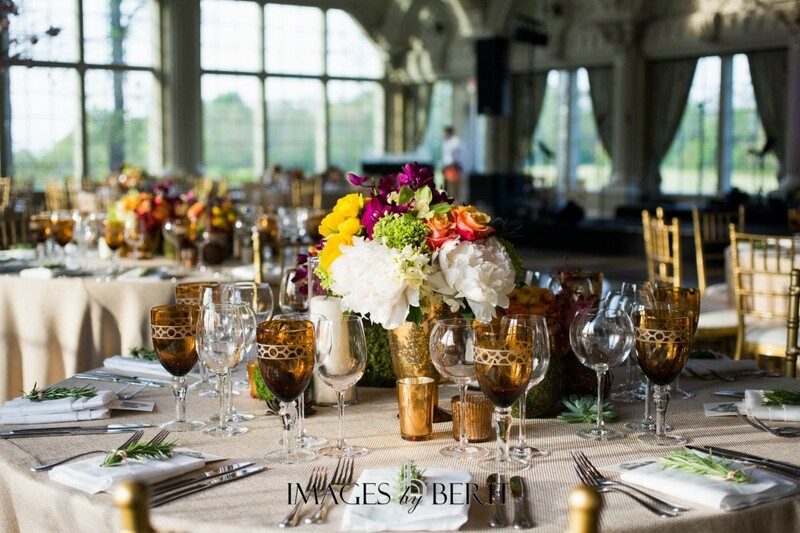 The common thread featured rustic, elegant, lush displays with tons of color in the flowers. Texture was provided by adding moss and succulents. Photo courtesy of Images by Berit. 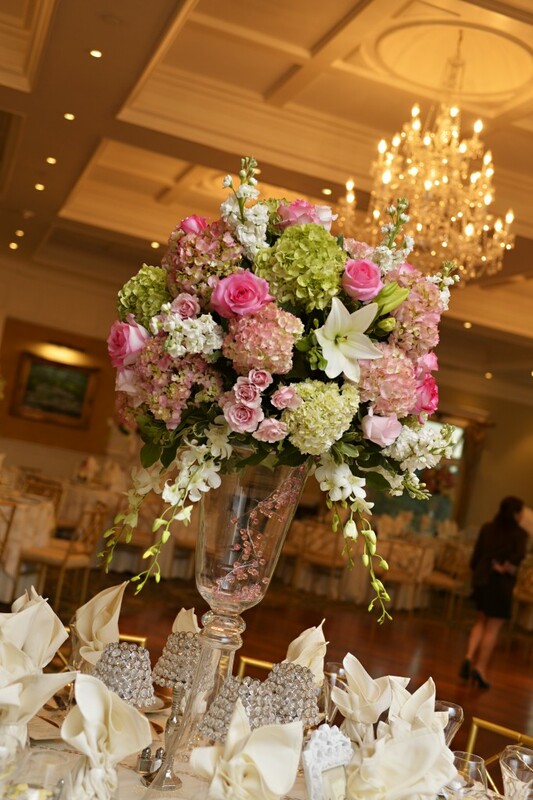 Dana and Cyril’s wedding featured two different centerpieces. 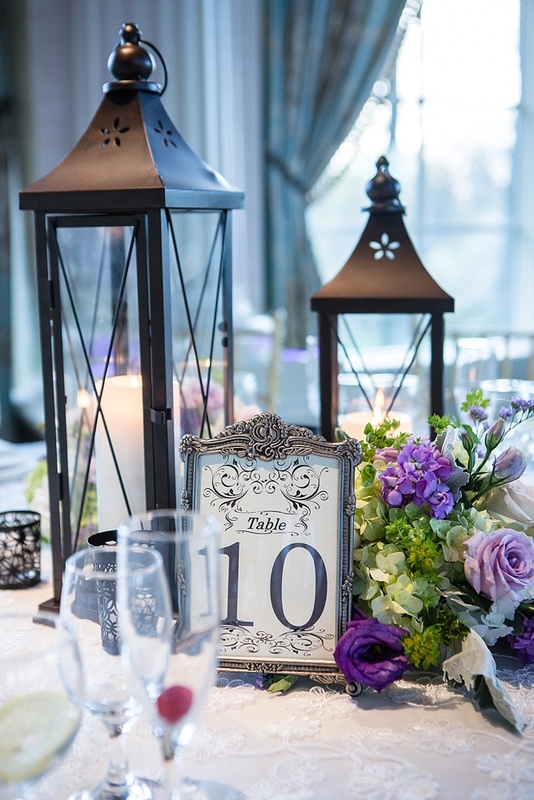 Shown here are the varying in size lanterns interspersed with lavender and green flowers including lisianthus. 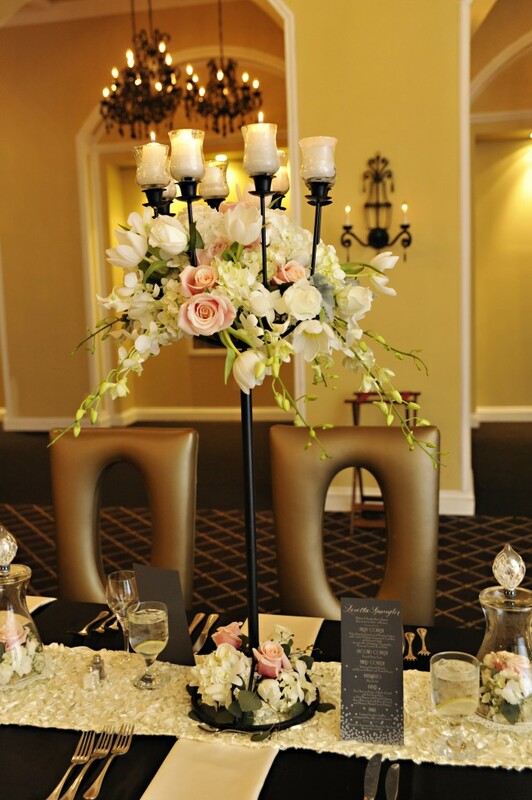 The second arrangement featured thick pillar candles on pedestals of different heights that were also interspersed with flowers. Photo courtesy of The Artist Group. Alison and Austen’s New Year’s Eve dinner featured the same candelabras that Caryn and Dan used. 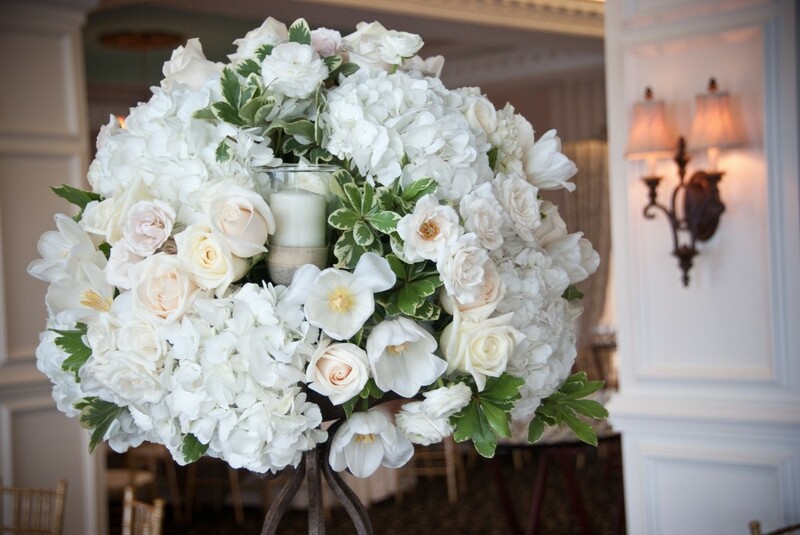 This time the arrangements were loose and flowing featuring pale pink roses, white tulips, white hydrangea, and white dendrobium orchids with more flowers at the base. Photo courtesy of John Arcara Photography.